Poppy Juice: How to Make Homemade Yogurt - Easy and Wholesome! 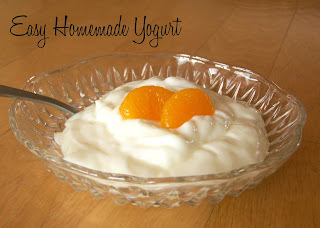 How to Make Homemade Yogurt - Easy and Wholesome! If you love yogurt it's worth it to make your own. Then you can control what goes into it and enjoy a cost savings as well. I found this recipe tucked inside one of my Grandmother's old recipe books. It is real yogurt, no gimmicks. This unique method is by far the most simple I've found. It is virtually fail-proof! Easy! 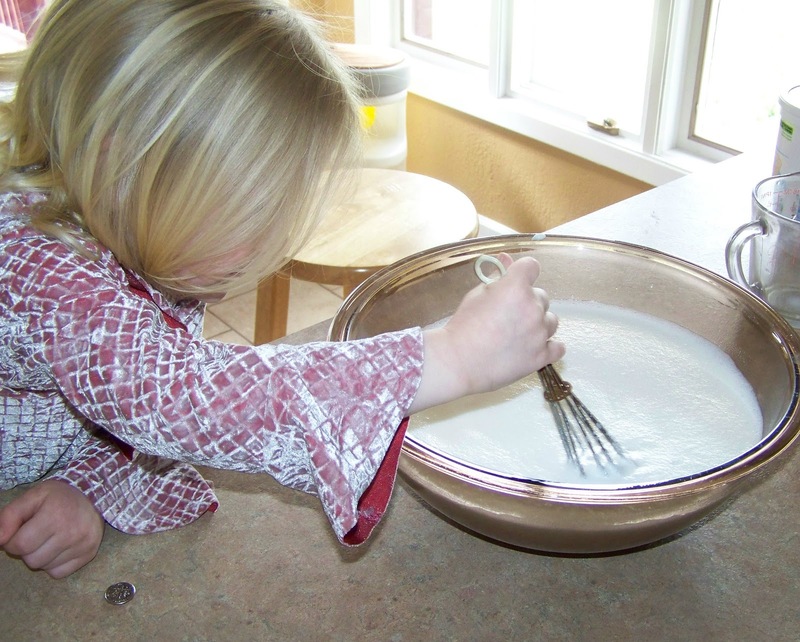 2) Measure 4 cups of non-fat dry milk into a large glass bowl. 3) Add 6 cups of cool tap water and stir to mix. - it will keep for several weeks. to start your next batch! If yogurt seems soupy after 12 hours you can preheat oven back to 275 and repeat process for a few more hours. I've found just having my oven light on keeps the temperature perfect. When you scoop out some of the yogurt, whey will seep into the indentation. 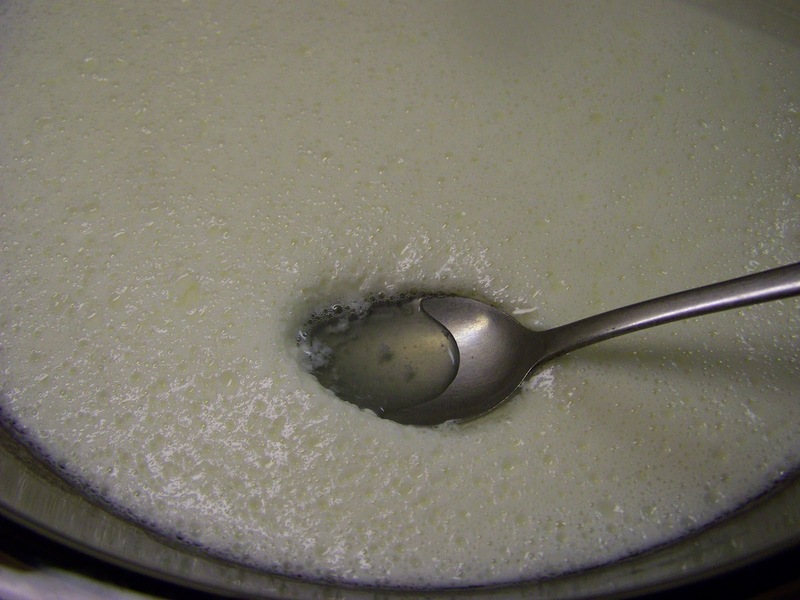 Drain off the whey and the yogurt will thicken. If you desire greek style yogurt, use cheese cloth to drain off the whey. Remember that too high heat (more than 130, I think) will kill your yogurt. This is what your yogurt will look like when it is done. Update! 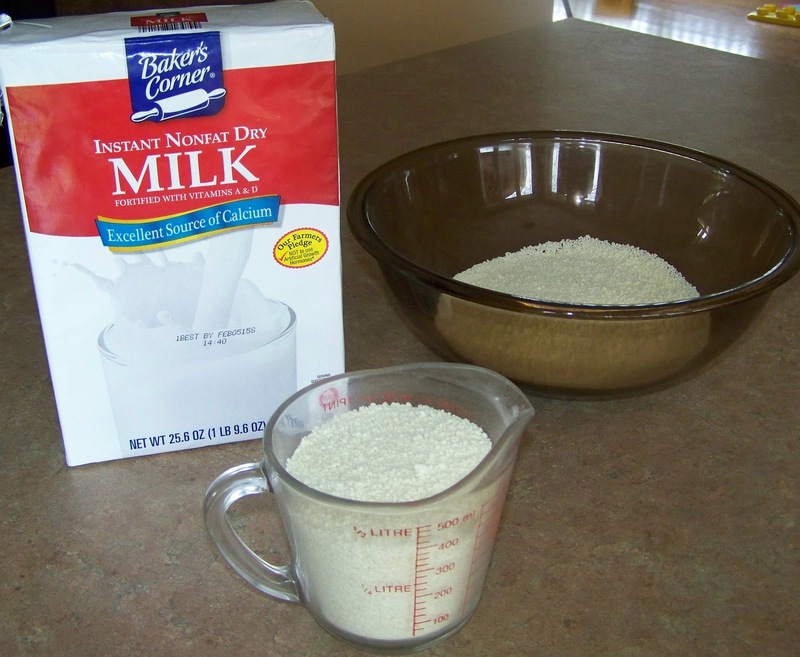 I've had a reader ask if they could use this same process with regular milk (instead of powdered). 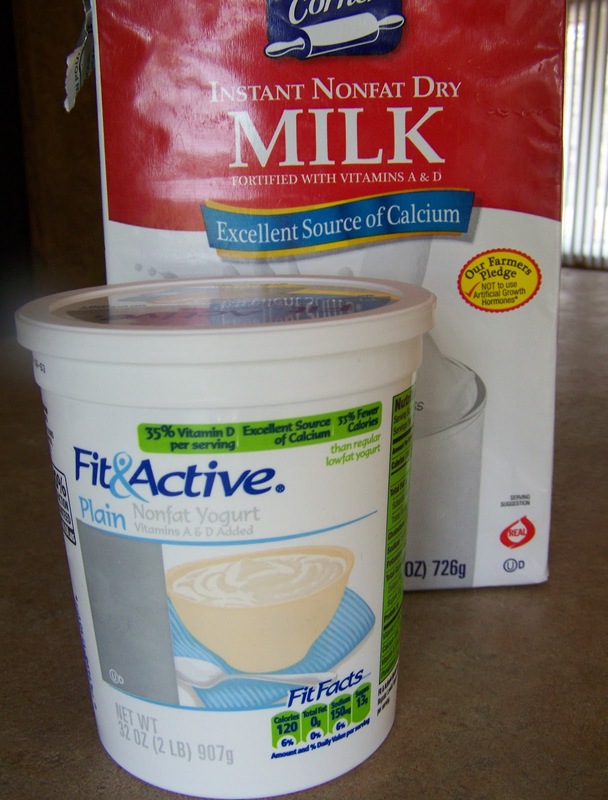 1) Use 6 cups of whole milk from the grocery store and allowed to warm to room temperature. 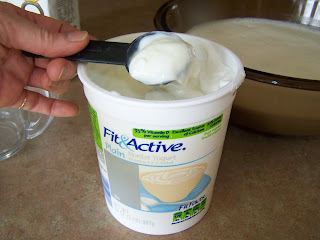 2) Add 3 tbsp of yogurt to mix then follow directions as stated in recipe above. 1) Heat 6 cups of whole milk from the store to steaming, allow to cool to 110 or so. The finished product was very thick and creamy. I am impressed! Still much easier than most yogurt recipes. As a side note, milk has been only $1.99 a gallon in our area. This is considerably less expensive than powered milk (approximately $3.50 per gallon for the Aldi brand). I will likely use regular milk until it becomes more expensive than the nonfat dried milk, simply of the cost. Thank you for sharing!! Would this recipe work using regular milk instead of making the milk with powder and water? I love making homemade yogurt, but the method I currently use is much more time consuming and complicated than this! Please do stop back by and let us know how your variation works for you! We are always up for trying something different! Glad you are having luck with powdered milk... I haven't unless it is added to whole milk but then what is the point? It does make it thicker. 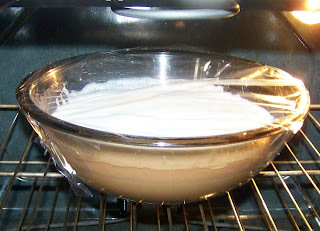 I use a Waring Pro Yogurt Maker instead of the oven and it comes out perfectly every time. Of course the yogurt maker is like a low temperature oven. And we make a gallon a week. Also, I would not go over 120F or else risk killing the culture. And I never keep yogurt in the fridge for over 2 weeks. And if you strain the yogurt through a coffee maker plastic strainer overnight you get thick Greek style yogurt. Thank you so much for your helpful tips (especially the thick Greek style)! I've wondered how well yogurt makers work but not went so far as to purchase one. We have a huge family and the yogurt maker I remember my mother-in-law had only made a little bit at a time. 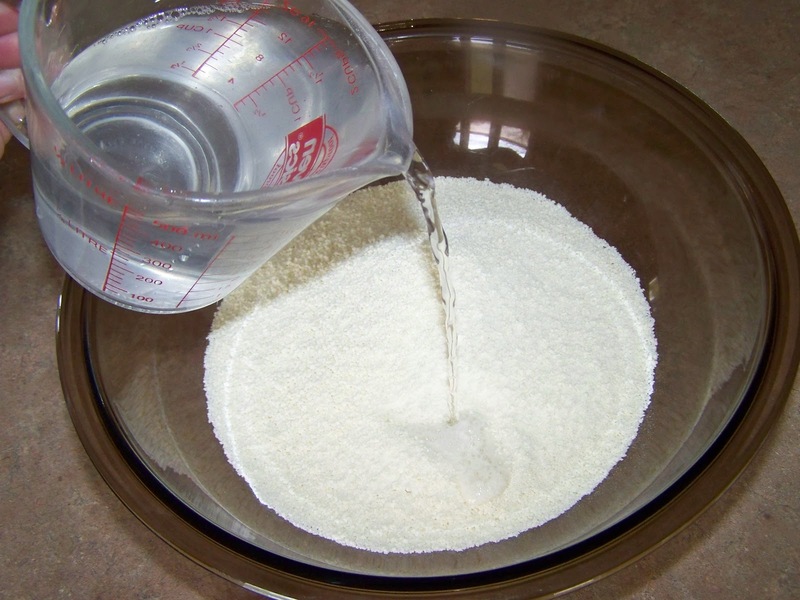 Also, on the powdered milk, 4 cups to 6 cups of water is a pretty concentrated ratio. Maybe that is why it works so well. And yes, it would be better to keep the temp lower rather than higher. My oven light keeps the temp around 100 to 110 degrees for the majority of the time. Thanks again and please do stop back by! Thanks Poppy for this amazing and simple recipe. 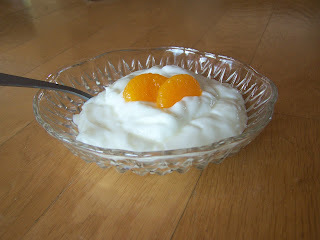 I made a batch last night and strained it for Greek yogurt this morning. It turned out great! Will keep the whey for smoothies. Are you on Pinterest? I don't see the P to follow you. Thank you for the positive feedback Martha! I'm so glad you liked the recipe. Yes, I am on Pinterest but my bottom is down a little way on the right sidebar. I suppose I should make it easier to find by placing it at the top of my page :) Thanks and have a great day Martha! Sorry, meant to say "button" not "BOTTOM" is down a little way on the right sidebar! How funny! I still don't see it. I can search for you. Should I look for Poppy, poppyjuice, poppy's tree house or something else? For a heat source, I use a plywood box with a light bulb installed.The culture and milk is allowed to work overnight. If new pasturized and unopen milk is used there is no reason to preheat the milk.